On the Way to 911Memorial | Custom & Private New York Tours, Inc.
There’s much to see on the seven mile stretch of The Westside Highway on the way to the 911Memorial; Riverside Park, Riverside Drive, The Hudson River, The West Village, Hell’s Kitchen, The High Line, Chelsea Market , The Meatpacking District, The Viacom Building, Richard Meier’s triple beauties, Jean Novelle’s new masterpiece next to Frank Gehry’s “sailboat building .” You’ll see the beautiful greenway at the water’s edge. Oh, and don’t forget Nicole Kidman’s new “engarage suite” car park outside her condo’s front door. 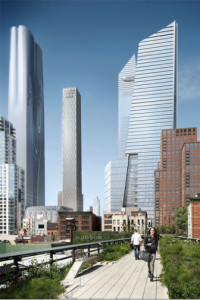 You’ll see America’s largest private commercial real estate construction project equivalent to eight Empire State Buildings A whole new city, Hudson Yards City, a work in progress.